The Bell Tower Shops is a fashion shopping destination for the Fort Myers-Cape Coral market. 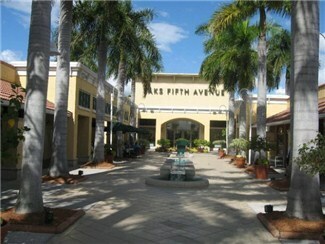 The open-air center is anchored by a Saks Fifth Avenue resort store, Fresh Market and a 20-screen Regal Cinema complex. The exceptional collection of specialty retailers includes AnnTaylor, Banana Republic, Brookstone, Gap, Johnny Rockets, Talbots, Williams-Sonoma, and Bed Bath & Beyond. Extensive landscaping complements the center’s architectural beauty to create a sidewalk garden setting that attracts the area’s affluent residents and vacationing shoppers. Lush landscaping, splashing fountains and open-air spaces meet high fashion, creative cuisine and “be seen” events at Bell Tower Shops. This landmark shopping, dining and entertainment destination is home to 40 fine retailers including eclectic boutiques and shopping favorites Saks Fifth Avenue, Williams-Sonoma, Ann Taylor, Chico’s, Banana Republic and Talbots. Exceptional shopping is complemented by nine distinctive restaurants: Bacchus, Bistro 41, Crü, Blackhawk Coffee Café, Blue Pointe Oyster Bar & Seafood Grill, Cantina Laredo, Mimi’s Café, Taste of New York and T.G.I. Friday’s.